Nature Tours, Raptors, vultures, eagles and wetland birds photography. Hide photography from professional hides and low level angle. Full board trip for 7 days (6 nights). 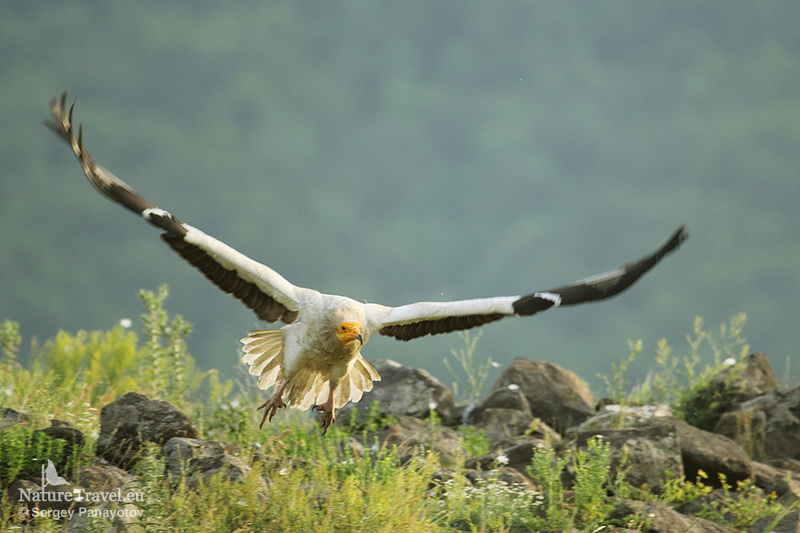 This bird and wildlife photography tour is focused on the most interesting raptors in Bulgaria - griffon and Egyptian vultures. This is the only place in Bulgaria and Europe where you can photograph all European vultures in one place plus golden eagle, white-tailed eagle, black kite, fox and probably wolf. The tour is in late spring when the raptors are very active. Egyptian vultures collect nest material in front of the hide, griffon vultures and golden eagles are also there feeding on the carcass. It is common to have Egyptian and griffon vultures simultaneously in the same frame. 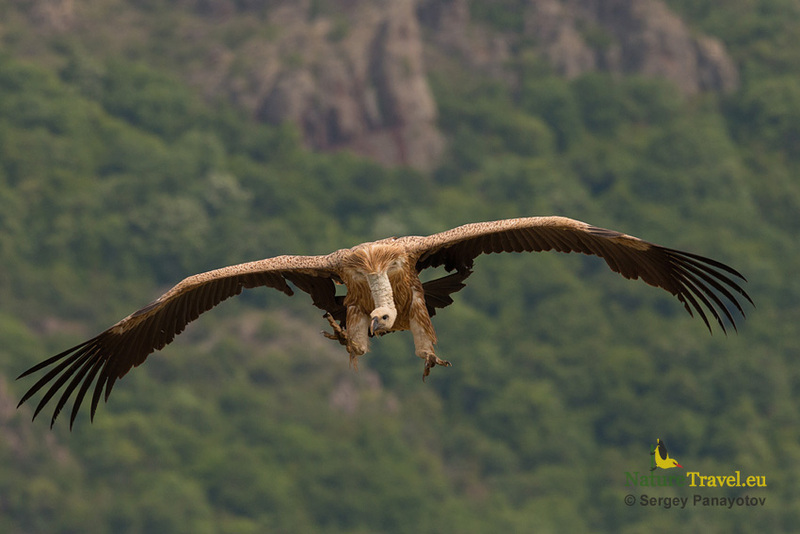 Sometimes golden eagles are also in the feeding station and if you are lucky, you can photograph fights between the golden eagle and griffon vultures. Wolves and red foxes are also in the species list for this hide. The landscape in the area is incredible. The background is the opposite hill, so it will be clear and blurred with your long lenses. In the springtime the field in front of the hide is covered with colorful spring flowers in different colors and interesting stones, which are used like landing spots. There is a perfect opportunity for flight shots. The other hide which you will visit is especially designed for wetland birds like herons, egrets, ibises, terns, waders, ducks, and others. In front of the hide is a wooden platform. The terns nest on the platform just 5 meters from the hide. It is therefore perfect for action shots with flying and fishing terns. Our new hide is very spacious and comfortable, with high regulated chairs, a toilet, electricity, etc. Excellent opportunities for low-angle photography, which is most important for clean background over the water. Photographs are taken through one-way mirror windows, which guarantees invisibility of the photographers. Both hides are comfortable, equipped with a heater and a chemical toilet. This tour is organized together with the Bulgarian Society for Protection of Birds (BSPB – BirdLife Bulgaria) and part of the income is going to be used to directly support conservation activities. Day 1: Arrival in the area with hides near Madzarovo, Eastern Rhodope mountain. The transfer will take about 3-5 hours depending on the arrival airport. Best is to book flights to Bourgas airport, in this case the transfer time will be shorter. We can have a short walk, dinner and then brief instructions on how to photograph vultures and eagles, how to behave inside the hide and some tricks for better images. Shooting is through embrasures, the photographers can observe the area and what is happening in front through a small window above the embrasures. Visibility is very good and you can easily monitor incoming birds, which gives time for better reaction for the action shots. Day 2, 3: Very early start, quick breakfast (optional breakfast in the hide) and drive to the hide (about 30 mins) - off road drive, quiet and quick settling in the hide. The experienced guide will help you if you have any questions during your stay inside. We will have packed lunches, hot drinks and water. Besides the vultures, other species that can be photographed are golden eagle, black kite, white-tailed eagle, wolf or red fox. Day 4: Breakfast and transfer to the other bird spot for wetland birds – it will take less than two and a half hours. We will drive first to our base for the next few days for a check in – a small family hotel. We will then have an afternoon session in the hide. 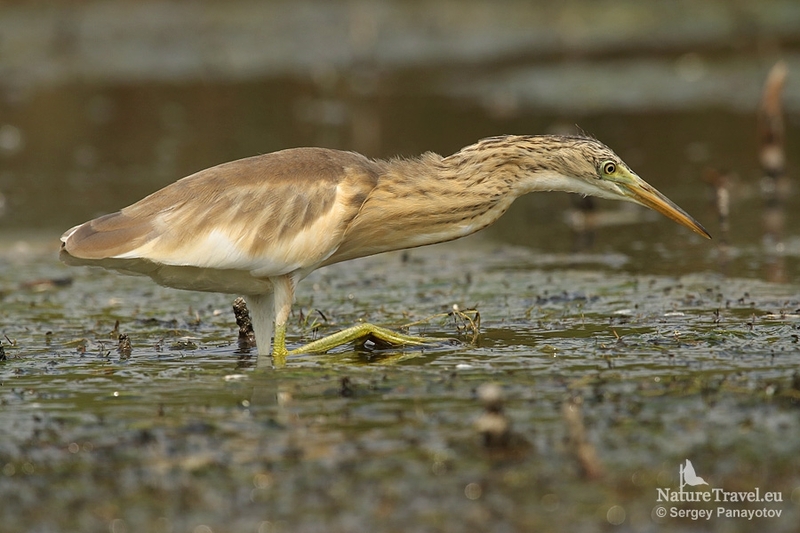 Possibilities include egrets and herons, ibises, spoonbills, waders, ducks, and others. More photos from the Wetland hide. Day 5, 6: Two full days of photographing wetland birds. We spend the whole day in the hide. Our new hide is very spacious and comfortable, with high regulated chairs, a toilet, electricity, etc. Excellent opportunities for low-angle photography, which is most important for clean background over the water. Photographs are taken through one-way mirror windows, which guarantees invisibility of the photographers. Day 7: Time to pack and transfer to the airport for your flight back home, hopefully with some memorable photos. Equipment: Best lenses are in the range of 400-600mm. The best way is to bring a zoom lens 200-400 (100-400 mm) and one 600mm. Tripods, backup batteries and memory cards are required. Warm clothes in spring and winter months; dark color of clothes is required; repellents for mosquitoes and ticks are necessary in the hot days.